Top local artists perform an outdoor show on May 2nd, 9th, 16th, 23rd, & 30th. 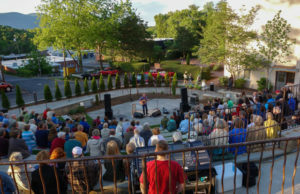 As the weather heats up this spring, the Peterson Amphitheater comes alive with great music from a variety of regional and national acts. Join us at 7:00 p.m. for Thursday evening concerts. A $10 donation is gratefully accepted at the door and concessions and a local food truck are onsite. No coolers or animals, please. Check back soon for the line up! The 2019 spring Sunset Series is sponsored by the Plume Family Foundation.